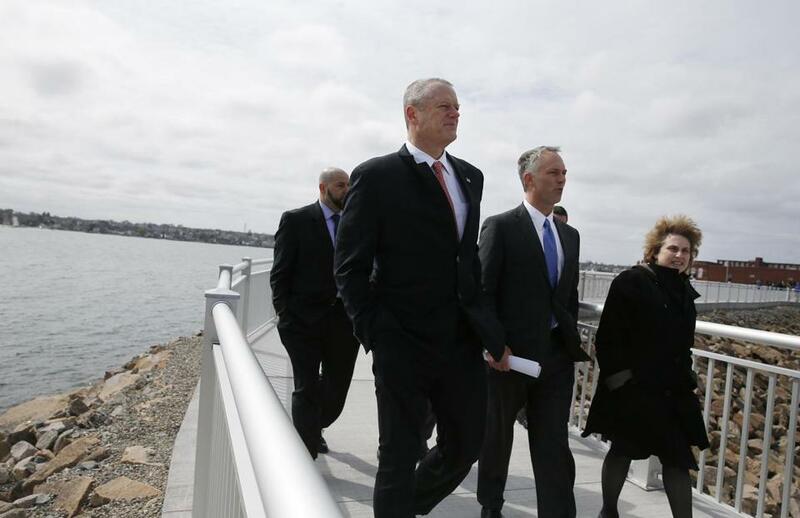 A consortium of conservation groups gave the administration of Governor Charlie Baker a mediocre “C” for his environmental efforts. For the second year in a row, environmental groups have issued a “mediocre grade” for the Baker administration’s efforts to address issues such as climate change and land conservation. In a report card released Thursday, the groups gave the administration a “C” for its efforts to protect the environment, the same grade it handed out last year. Individual grades included an “A” for implementing a food waste ban for large institutions, and a “B+” for land conservation and promoting energy efficiency and electric vehicles. On the other end of the scale, the administration received a “D-” for its collection of solid waste data, and a “D” for pursuing new natural gas pipelines, its efforts to curb greenhouse gas emissions from the transportation sector, and water pollution. The groups also gave the administration a “C” for “inadequate funding” of state environmental agencies, which they blamed for significant declines in enforcing regulations, backlogs in water permitting, and deteriorating conditions at state parks, forests, and campgrounds. According to the groups, spending on environmental protection this year dropped by $13 million to “an inconsequential” $218 million, or just 0.53 percent of the state’s $40.9 billion budget. Baker has failed to fulfill a campaign pledge to increase spending on environmental protection to 1 percent of the overall budget, leaving environmental agencies “border[ing] on the dysfunctional,” the groups said. State environmental officials defended the administration’s record but declined to address the report directly. “The Baker-Polito administration is committed to ensuring that Massachusetts remains nationally recognized as a leader in combating climate change by securing clean, affordable energy, and is pleased our state is on track to successfully reducing greenhouse gas emissions by 2020 through a collaborative approach across state government,” said Peter Lorenz, a spokesman for the Executive Office of Energy and Environmental Affairs. Last year, the Supreme Judicial Court ruled that the state had failed to comply with a 2008 law that required regulators to set specific limits on various sources of greenhouse gases to reduce carbon emissions 25 percent below 1990 levels by 2020. The administration plans to seek a budget increase for environmental protection for the coming fiscal year, he said. The report was produced by the Charles River Watershed Association, Clean Water Action, Conservation Law Foundation, Environmental League of Massachusetts, Environment Massachusetts, Massachusetts Rivers Alliance, and Massachusetts Sierra Club.